diseases found in their environments. And now for the first time, scientists have discovered how they do it. 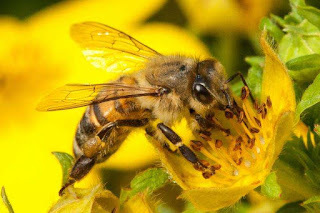 Helsinki, University of Jyväskylä and Norwegian University of Life Sciences made the discovery after studying a bee blood protein called vitellogenin. The scientists found that this protein plays a critical, but previously unknown role in providing bee babies protection against disease. investments in basic research pay off." University of Helsinki adds: "I have been working on bee immune priming since the start of my doctoral studies. Now almost 10 years later, I feel like I've solved an important part of the puzzle. It's a wonderful and very rewarding feeling!" pathogens in the environment while gathering pollen and nectar. contains bacteria from the outside environment. diseases found in their environment once they are born. something researchers did not know until now. edible and natural vaccine for insects. "We are patenting a way to produce a harmless vaccine, as well as how to cultivate the vaccines and introduce them to bee hives through a cocktail the bees would eat. They would then be able to stave off disease," said Freitak. vaccine would be extremely beneficial. It's widely known that pollinators, including bees, are facing serious environmental dangers. During the past six decades, managed honey bee colonies in the United States have declined from 6 million in 1947 to only 2.5 million today. Not only are bees affected by diseases, they have been decimated by a phenomenon called colony collapse disorder. security, contributing 35 percent of global food production. In North America, insects pollinate 87 of the top 115 food crops and honey bees are vital in keeping fruits, nuts and vegetables in our diets. important role in helping to combat colony collapse disorder, in addition to fighting a variety of diseases. "Because this vaccination process is naturally occurring, this process would be cheap and ultimately simple to implement. It has the potential to both improve and secure food production for humans," said Amdam.